SINGAPORE, November 15. /TASS/. 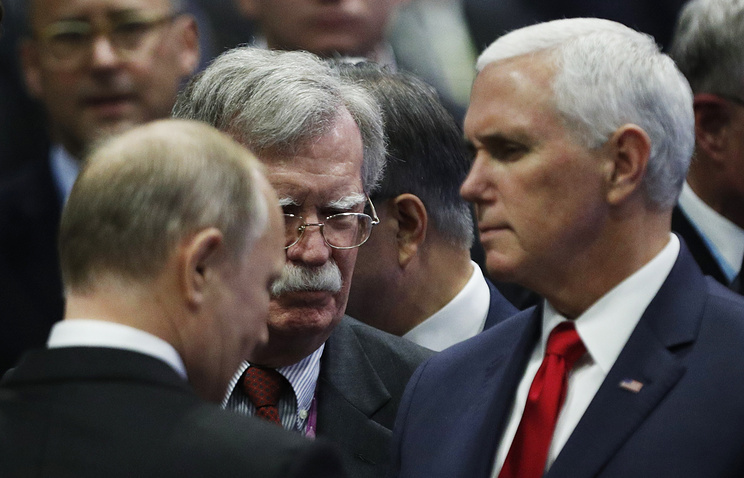 Russian President Vladimir Putin has spoken briefly with US Vice President Mike Pence and White House National Security Adviser John Bolton before the beginning of the plenary session of the East Asia Summit in Singapore. Before taking part in the joint photo op session, Putin talked to Pence, who leads the US delegation, for a couple of minutes "on the go" in the presence of an interpreter. Bolton took part in the conversation as well. Prior to that, Putin also spoke briefly with Indian Prime Minister Narendra Modi. 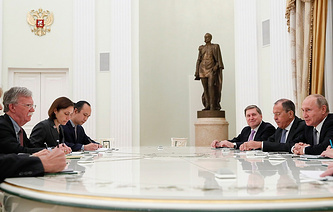 The meeting was attended by Russia’s top diplomat Sergey Lavrov. The East Asia Summit is an authoritative platform for cooperation between countries in the Asia Pacific on a wide range of political and economic issues. Traditional agenda includes ensuring peace and stability in the Asia-Pacific region, improving regional security architecture, cooperation in the spheres of energy, ecology, healthcare, education, financial issues, food security and others. This annual international forum has been held since 2005 in connection with summits of the Association of Southeast Asian Nations (ASEAN). The forum brings together 18 countries - ASEAN member countries (Brunei, Vietnam, Indonesia, Cambodia, Laos, Malaysia, Myanmar, Singapore, Thailand and the Philippines) and dialogue partners (Russia, US, Japan, South Korea, India, China, Australia, New Zealand). This year, Russia is represented at the event at the top level for the first time. In 2005, Putin attended the first East Asia Summit in Kuala Lumpur, Malaysia, as a guest of honor.